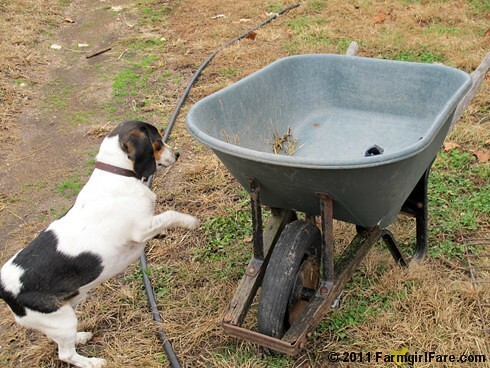 There's no doubt about it—farm dogs love stinky stuff. There's nothing like relaxing on a giant pile of aged sheep manure! 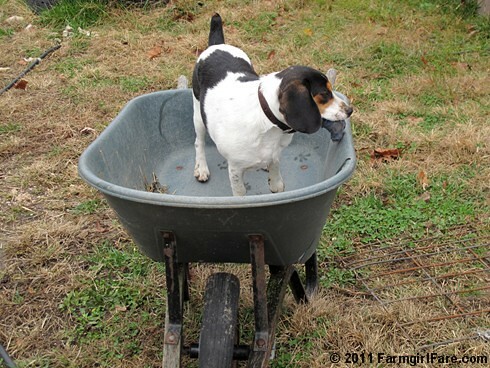 So when I pulled an icky vet wrap bandage off a ewe's hoof yesterday and tossed it into an old wheelbarrow (where it would be out of reach of the dogs) while we finished chores, it was no surprise that beagle Bert sniffed it out in seconds. But since he couldn't manage to tear into a thousand pieces like he does with all his other treasures, it didn't occupy his attention for long. On to the next thrill! 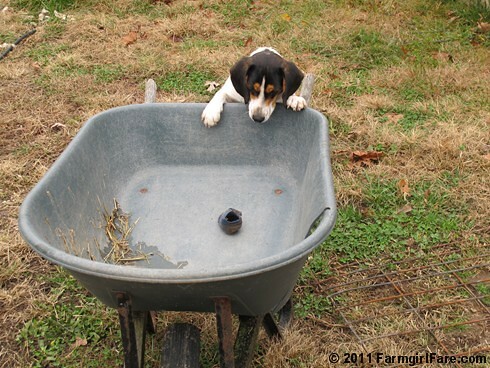 © FarmgirlFare.com, home of the limited attention span, where there's probably something even more exciting waiting down the road. Love it!! Our new puppy is transitioning from city dog to country dog, and loving every stinky (and poop filled) minute of it! *Blechhh* Those stinky hoof wraps make me GAG! 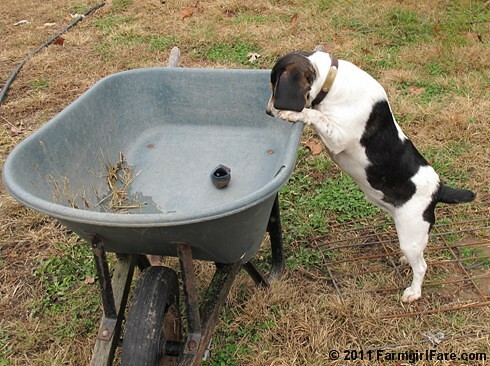 Bert was sure determined to get it! Oh, adorable and hilarious and icky, all in one! Eeewwwwwww! 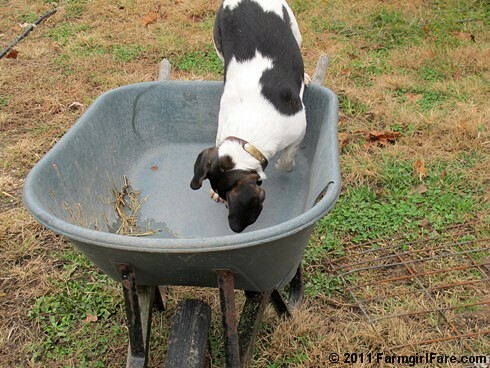 That seems pretty awful on the icky scale, but leave it to a dog to find it the most interesting! That Bert is quite the entertaining fellow, isn't he? Hilarious! Reminds me of our dogs! When I was growing up I used to watch my corgie go out in the field and eat horse poop! Yuck..i believe the dirty diapers in my house would be a big hit! He is just the cutest and funniest. We once had a beagle and everytime we walked him at the beach he would find a dead rotten bluefish to roll in...never failed.